Why are temperatures generally hotter in the Middle East than in Europe? How come the average temperature in the middle east (Israel, Saudi Arabia, Sudan or lower) is always so much significantly higher than in Europe (say Germany, England etc.)? I know that the sun rays pass a greater distance to Europe than the middle east, but is that the only factor influencing? And also, the distance isn't that much greater so how come the sun is weakened so significantly in Europe in comparison to the middle east? The distance of the Sun from Europe or the Middle East plays virtually no role. After all, many people on the Northern Hemisphere might be surprised that the Earth is closest to the Sun in January – it was on January 4th, 2014. It was 3 million miles or 3 percent closer than it is in July. Nevertheless, the winter is cold! Moreover, these 3 million miles are much greater than 3 thousand miles between Europe and a place of the Middle East but even 3 million miles are too small to really matter. 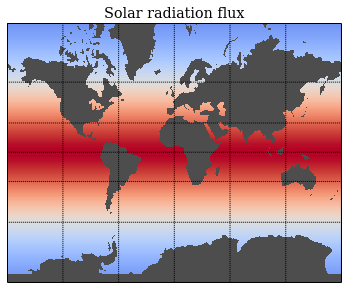 The winter is cold and Europe is colder than the Middle East for the same reason: the sun rays are bombarding the Earth's surface from a more "horizontal" angle than in the summer or in the Middle East throughout much of the year. When the angle of the sun rays is $\alpha$ from the vertical direction, the actual energy and heat coming per unit are is $$ \cos\alpha\cdot P $$ where $P$ is the power you only get if the rays are bombarding the surface from a perpendicular, normal direction. If you substitute $\alpha\to 90^\circ$, the expression above goes to zero. The values of $\alpha$ are generally smaller in the Middle East than in Europe and $\cos\alpha$ is therefore greater because the Middle East is closer to the equator, it has a smaller "latitude", we say, and the equator is the place where the Sun often illuminates the Earth's surface from a perpendicular direction. On the contrary, the poles are cooler because the solar radiation only "touches" the surface while it moves almost horizontally. Consequently, $\cos\alpha$ is very small. Europe is somewhere between the Middle East and the North Pole so its temperatures are somewhere in between, too. 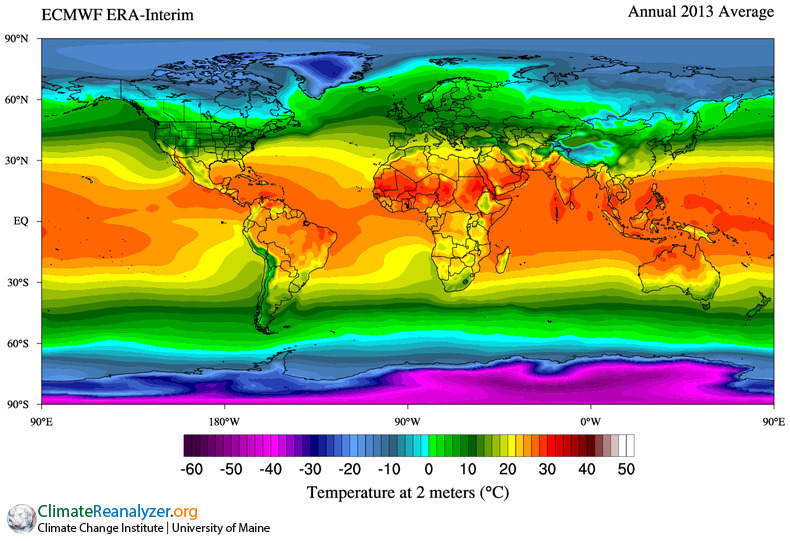 Image obtained using Climate Reanalyzer (http://cci-reanalyzer.org), Climate Change Institute, University of Maine, USA. I've tried to replicate their crazy color scheme. The point is, gross temperature phenomenon on the earth is dominated by the radiant solar flux. 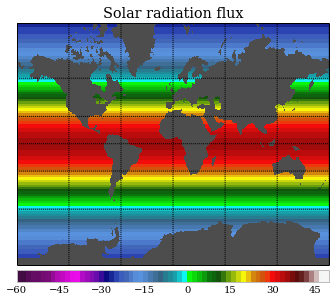 Regions near the poles are colder because the incoming light flux is spread over a larger area. Imagine trying to hold a surfboard perpendicular against the flow of a river, its hard, but if you tip it so that it comes at an angle to the incoming water, it becomes easier. Not the answer you're looking for? Browse other questions tagged temperature earth sun geophysics climate-science or ask your own question. How can anything be hotter than the Sun? 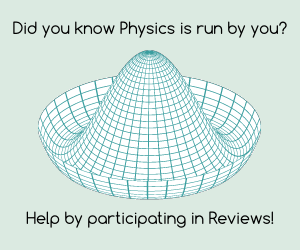 Why does absorption cause seismic pulses to increase in length over distance? Why does the Sun always rise in the East? Are the electrons at the centre of the Sun degenerate or not? What exactly will happen if a small planet collides with Earth? Can you get a sunburn faster in the evening than at noon on a boat? Why is the tropopause at a higher altitude at the equator? How much does temperature affect the time of sunrise?